Performers include: Raven-Symoné, Orlando Brown, Kyle Massey, Anneliese van der Pol, Rondell Sheridan, T’Keyah Crystal Keymáh, Frankie Ryan Manriquez, David Henrie, Bobb’e J. Thompson, Lil J, Rose Abdoo, Ashley Eckstein, Jordyn Colemon, Andrea Edwards, Anne-Marie Johnson, and Jodi Shilling. Raven Baxter (Raven-Symoné) is a teenager with the ability to foresee the future. She sometimes tries to prevent what she sees and that’s what gets her into trouble because she often misinterprets her visions. Raven uses her ability as a master of disguise to try and fix the problems before they happen. Victor and Tanya Baxter (Rondell Sheridan and T’Keyah Crystal Keymáh) are Raven’s parents. Her father is a trained chef and owns his own restaurant, The Chill Grill. Her mother is very caring and is always there for her children. She stopped her own studies in order to raise her family and is returning to studying law now that they’re older. Her mother, Raven’s grandmother, is also psychic. Cory (Kyle Massey) is Raven’s younger brother and the drummer in a band with two other boys. Obsessed with finances, he’s often coming up with new schemes that should make him rich but usually only end up making trouble. Celsea Ophelia Daniels (Anneliese van der Pol) is one of Raven’s two best friends. She’s a secret artist, an evironmentalist, and a vegetarian. She doesn’t seem very bright and makes jokes that only she finds amusing. 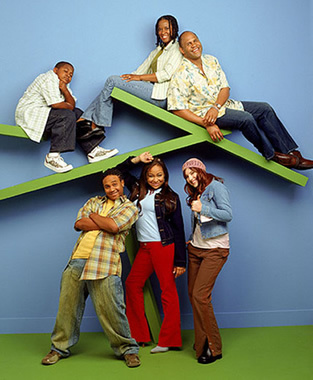 Edward “Eddie” Thomas (Orlando Brown) is Raven’s other best friend. He’d like to become a rapper someday but, for now, is a guard on the school’s basketball team. He and Raven try a romantic relationship at one point. It ends quickly but, in two of Raven’s visions, he’s shown to be her future husband.